The ARDUINO compatible → maroon Shield offers an 8×8 LED-matrix-display to show scrolling text or graphics. Text and grafic can simply be send over the serial interface. 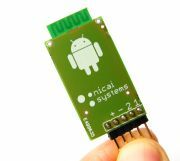 With the → bluetooth radio module NIBO Blue you can remote control your robot by an Android App. Additionally the modul transmits sensor values. These values can be displayed e.g. on Android smartphones. The → Tuning-Kit contains one ATmega1284 with 128 kByte flash, one ATtiny84 with 8 kByte flash and one 20 MHz crystal. The ATtiny 84 is already programmed, so you can program your own code on the ATmega1284.